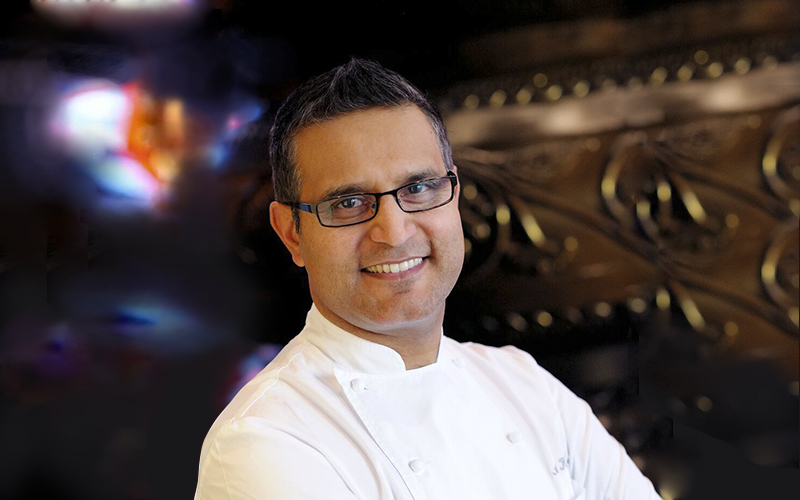 Your restaurant Tamarind was the first venue to get a Michelin star for Indian cuisine, how has that impacted your career? It didn’t make me a superstar or anything. I think it came with responsibility, and all of a sudden, I felt like, “gosh, I never worried about these things. Now I have to worry about them”. You realise that you are responsible because you become a kind of icon for a lot of young chefs. Not that I was a naughty kid on the block, but I became really conscious of what I did and what I didn’t do. I have carried my tradition, my profession, my ethos very carefully since then. Do you feel the pressure of Michelin? I actually never felt the pressure, I’ll be very honest. I’ll be lying if I said I didn’t worry about it, but it’s not a pressure. A week or ten days before Michelin comes out, I’m a little excited, my heart is beating at a slightly higher pace. But I’m not chasing accolades. It’s important to get the balance right. It took three years for me to get to the star again after leaving Tamarind. My priority was to run a successful business. I was employing 50 people in my restaurant, I felt that I was responsible for them, and I had to make sure the business succeeded. Tandoori, it’s such a popular style of Indian cooking, but many people don’t have a Tandoori oven. I don’t have a Tandoori oven at home, but I still always manage to cook Tandoori chicken. I learnt to cook it without an oven when I had to open a restaurant on a cruise ship. You’re not allowed charcoal and gas or anything, so I had to devise a way to cook Tandoori. I would marinate the chicken with a classic marinade. Ginger, garlic paste, red chilli paste, lemon juice, and all that goes in, spices go in. I would marinate the chicken first and then put it in a bowl. Then I would take a small stainless steel bowl, put a lot of charcoal in there, and use a lot of foil or a lid from a box or tub, to put on top. I would pour butter on the live charcoal and close the lid or seal it with the foil, and leave it for a half an hour, forty-five minutes. The whole chicken is smoked, and filled with the flavour of smoke. Then I would roast it normally. It comes out like a Tandoori chicken. Better than Tandoori chicken sometimes. You can also get smart electric smokers these days, which cost about £50 (AED 000). They coume out beautifully as well. In your opinion, what do many home cooks get wrong when they’re making a basic curry? While cooking curry, I think people try too hard. That’s the basic problem everyone has. People get carried away. I can add more curry. I can add more chilli, and can add this. More is not necessarily good. I always say that if you’re a new person when it comes to cooking with spices, use your salt and pepper sense. Those senses will be your guide through a maze of spices. There’s no spice, other than chili or black pepper, which would overwhelm, to be honest. As you go along, you should pick up a grain of spice, it’ll tell you whether you can or cannot use it. Do you have any particular message for amateur cooks out there that want to improve their cooking? The only thing I want to say is get going, don’t worry about it. As a professional chef, don’t I burn dishes? Don’t I land bad dishes? It’s just that I’m very good at not telling you. It happens to everyone. Is there a food that you hate that you avoid cooking, that you just know I don’t want to ever cook that food? I hate eating, insects. I’ve been made to eat insects for TV, I’ve done that. Never again. When I was young I was traveling to Thailand and Chung Mai, with a couple of friends and we were really hungry. Those were really poor days then, early cheffing days. We took a bus to go to a different village, and there was nothing to available to eat. This guy came with plastic bags and offered fried or salted peanuts. I bought some, and while talking, I just dipped my hand into the bag and looked at them, and it was all insects. I gave them to some local people sitting nearby. They enjoyed them, it was like popping candies for them. I hate it. I am not for molecular gastronomy. There was a time when molecular gastronomy was the king, and everybody was looking at it with great awe. I don’t think we need to go there, because I do believe that we allow our food producers to pump enough chemicals in our food. As a chef, do I need to do that again? No, I don’t think so. I want to stay clear away from it. I don’t bring anything that I feel that is not part of my food. And that certainly is not part of my food.